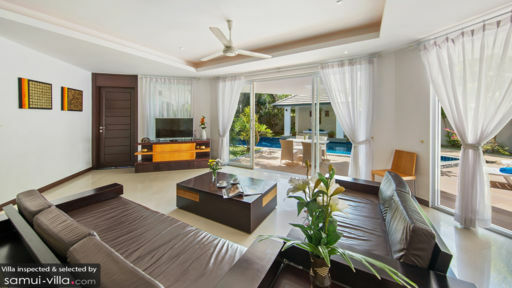 Lipa Talay Haa boasts beautifully appointed living spaces, a private pool and landscaped grounds. Containing two bedrooms, the villa is ideally kitted out for small families or two couples, as well as honeymoons and corporate retreats. It also enjoys a prime location just a stone’s throw away from Lipa Noi Beach, and a serene ambience that facilitates rest and relaxation. Four guests are accommodated in two bedrooms. Each room comes fitted with king beds, generous wardrobe space, a work desk, air conditioners and ceiling fans. The attached en suite is incredibly spacious, with twin vanities, a toilet, bathtub and shower alcove. 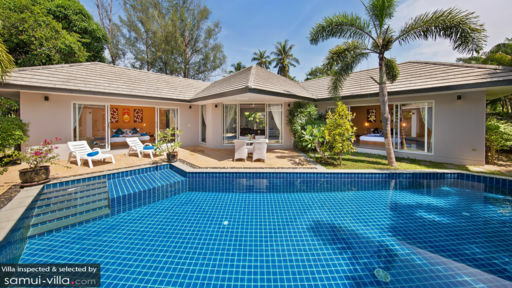 Sink back against the poolside loungers as you take in views of Lipa Talay Haa’s picturesque garden. A sparkling pool invites vacationers to cool off with a dip, while relaxing massages are enjoyed at the shaded sala. An outdoor dining set lets vacationers dine under the starry night sky by the poolside! Each of the living spaces are light-filled and airy, with full-length glass sliding doors, modern furnishings and air-conditioned interiors. The main living area boasts an open plan concept, with an indoor lounge that flows seamlessly into the kitchen and dining area. The open kitchen comes equipped with a full range of cooking amenities, while the dining area features a six seater dining set. Villa Lipa Talay Haa offers housekeeping, guest concierge, private chef and 24/7 security services. Feel free to reach out to your multilingual guest manager, who is fluent in English, French, German and Chinese for assistance with your holiday needs. A welcome pack with travel recommendations is provided at arrival, and guests may take full advantage of the barbecue amenities and in-villa massage treatments. A baby cot and high char are available at request. Lipa Talay Haa is located just a skip away from Lipa Noi Beach. The beach boasts a powdery white sand coast, and its tranquil ambience will appeal to beach-goers seeking a getaway from the crowds. Restaurants, beachfront bars and cafes are located within walking distance or a quick drive from the villa. Fine dining venues like The Five Islands or The Island View Restaurant offer an excellent dining experience. Check out Air Bir, a chic rooftop venue known for its delicate tapas dishes. For some of the best seafood dishes on the island, take a 20-minute drive to Thongkrut Fisherman’s Village, where you’ll find a good variety of seafood restaurants. Samui is an island that lends itself well to day trips and offshore expeditions. Located on the island are renowned attractions like Samui Cultural Center, Laem Sor Pagoda, Secret Buddha Garden, Big Buddha and Na Muang Waterfall. Or hop off on a speed boat to Angthong National Marine Park, an archipelago of 42 islands known for its spectacular scenery, as well as excellent scuba diving and snorkeling. Speed boats depart from Nathon Pier, and the journey to Angthong National Marine Park takes about 45 minutes.